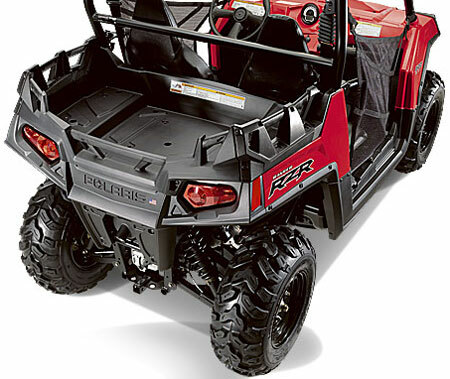 Polaris Ranger RZR 800 Gets Significant Upgrades. Polaris Ranger RZR - Is the New Upgraded Model a Best Buy? It seems like only yesterday that the Polaris Ranger RZR was introduced as the first sport UTV. Even though it was just 2008, a lot has happened recently in this white hot segment. We thought it would be good idea to revisit the Polaris Razor 800 for 2012 to see how it stacks up with the competition today. Several changes were made to the 2011 Polaris Ranger RZR 800 and those are carried over for the 2012 model year. Rather than any major design changes, these upgrades were more along the lines of refinements and tweaks to the original RZR. One of the biggest changes is a lower price, which always gets our attention! Polaris RZR 800 LE with Electric Power Steering. 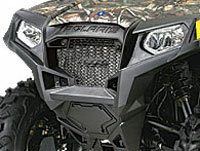 The video below will get you up to speed on the major changes made to the 2011 Polaris Razor 800. We'll delve into the details below the video. Our friend in the video did a good job of outlining the changes to the new Razor. The question is - does any of this matter in the real world? We'll go through the list and tell you what we think. Engine - All RZR 800 models now have the same upgraded engine that was standard in the Razor S. Several improvements were made to this engine for the 2011 model year. Most noticeable is the new Bosch electronic fuel injection system. There were a lot of complaints about poor throttle response and the erratic nature of the throttle action with the original RZR. We were among the complainers after our ride in a 2009 model. The 2012 Polaris Ranger RZR 800 we tried was much better, so we would say this issue is solved. The slight horsepower increase and improved throttle response makes for a much better driving experience. Tighter and more tedious situations that require precise throttle control are much easier with this engine. Since the RZR 800 is intended for use on 50" trails, that's a big deal. Redesigned front end for better cooling. Cooling - The most visible change to the new Razor is the restyled front end. A larger radiator and the need to relocate it for better air flow dictated a much larger opening at the front. A side benefit is less clogging from mud and other debris that the old model suffered from. We heard several complaints about overheating on the older Razors, and these changes tell us Polaris must have too. They tell us the new system has an almost 30% gain in cooling over the old RZR model. Once again, the kind of tight trails and lower speeds the Polaris Ranger RZR is intended for, puts a lot of stress on the cooling system. The last thing you want is to be in the middle of nowhere with an overheated engine! Any improvements to the cooling capacity of the RZR 800 is a welcome change as far as we're concerned. 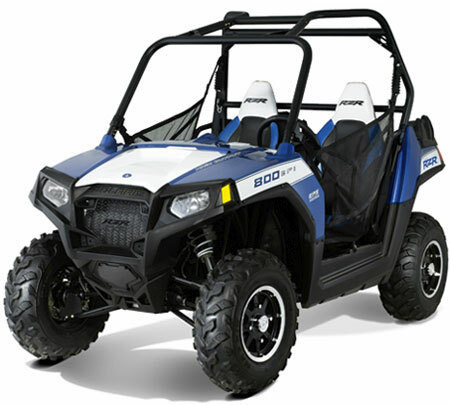 Storage - Lack of storage was a common complaint heard by many owners of earlier RZR models. As a sport UTV, the Ranger RZR was never intended to be a pack mule. But Polaris may have overdone the space and weight saving a bit too much on the original. Those complaints have been addressed starting with the 2011 and continuing in the 2012 Polaris RZR. A full 3 gallon capacity glove box has now been added to the RZR. It's amazing how much stuff can be carried in this thing, and how many headaches it solves. The rear cargo area was a another sore spot with a lot of owners. They loved being able to drive on 50" OHV trails, but didn't want to sacrifice so much storage space in the rear box. Polaris agreed, and the new Polaris Ranger RZR now has a larger rear cargo bed with extended rails. Volume is a whopping 60% more than the old model, and the new rails make it way easier to strap down even more stuff! New rear cargo box with extended side rails. Optional Electric Power Steering - While it still isn't standard on the RZR 800, at least it's available. If you've never driven a RZR, you might wonder why this would matter on such a small and lightweight side by side. Steering on the original Razor wasn't that stiff, but it was so slow that it could really get frustrating in tight maneuvering. It was the least sporty feature on a sporty UTV. In our opinion, the EPS makes a difference in the overall driving enjoyment of the new RZR. Response to steering wheel inputs is better, there is less kickback through the wheel in rough going, and if you ever have to turn around on a tight trail, you'll be glad you have power steering. It's only available on a special LE model in 2012, so it's a little pricey. You may decide it's not something you need, but try a RZR with it before you decide. Trust us on this! LE Packages - Two Limited Edition packages are offered with different color schemes and a price of $11,999. You have your choice of a White Lightening/Red or a Magnetic Metallic/Silver. They include Maxxis Tires on Black Crusher wheels along with some special trim and graphics on the interior and body. The top package is called the Boardwalk Blue with EPS and is priced at $12,999. It includes everything in the other LE packages and adds the factory installed Electric Power Steering unit. Other Tweaks - These fall in the category of refinements and minor changes more than major improvements. They include an improved dash seal to limit dust and heat in the cab area, better bushings in the passenger grab rail to eliminate a rattle, and a thicker skid plate for better underside protection. The shocks get upgraded for better durability. At a list price of $11,299, down from the $13,999 price of the original, is the 2012 Polaris Razor a Best Buy? Thanks to Polaris themselves, that's a much harder question to answer in 2012. What happened? Well, the 2012 Polaris RZR 570 has been introduced at a list price of $9,999. After having a chance to drive one and compare head to head to the RZR 800, it makes picking a UTV for 50" trails a lot tougher. It's really hard for us to say the 2012 Polaris Razor is $1,300 better than the 570. The 800 with the larger twin cylinder engine may be a little better with a heavier load. Since the RZR 800 has been out for a few years, all the refinements definitely address most of the problems, so you get a very well sorted machine. The Razor 570 is still a bit of an unknown when it comes to reliability and any possible small problems. Our best advice is to test drive both before you make a final decision. One thing we can say for sure is that all the improvements to the Polaris Ranger RZR 800 have made it an even better and more enjoyable UTV than the original.